One of my (Diana’s) biggest worries before taking of on a roadtrip in our camper: what if our daughter won’t sleep anymore? It took a full 13 months to get her to sleep through the night (which is completely normal of course). Right before the start of this trip we would change every routine again: no fixed bed, no fixed room, no airconditioning or heating when necessary. ‘How am I going to do this?! ?‘ So, when we bought the van in 2012 we found this bunk bed fold into a hidden cupboard of the bus and we knew other families had used it for babies and toddlers. 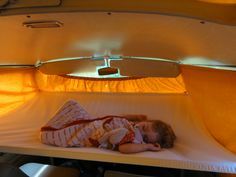 While preparing the ‘sleep‘ part of the trip, I had found a picture on Pinterest of a baby in a t2 bunkbed, so I knew it could be done. We wanted to make this bed like it would be her ‘room‘, her space to feel secure in, a place she could climb in and out of herself if she would be a little older. The first worry to solve was to prevent her from falling or climbing out when she was still so small. We (still) wanted to have some control of when she would come out of bed. So we had some kind of tent designed in Mexico made out of an old duvet cover of ours in nice pink colors :-). In cold weather this would be her safe space. We could put this ‘tent‘ on top of the bunkbed, put it up and had mosquito nets sewed in. This would prevent her from falling out of the bed on the sides where the windows are open. The picture shows you the tent on top of the bunk bed. In the beginning she would not sleep of course and tried to pull down the tent, climb out, or play with the mosquito net curtain. It took about two weeks to make her familiar with sleeping in this bunk bed, as it is quite different from a normal baby bed. At first she did not want to sleep in it during the day and kept playing. At night, when it was dark, it was no problem, she would play a bit with her bear and fall asleep fairly soon. She did keep waking up once a night for a bottle of water for weeks.